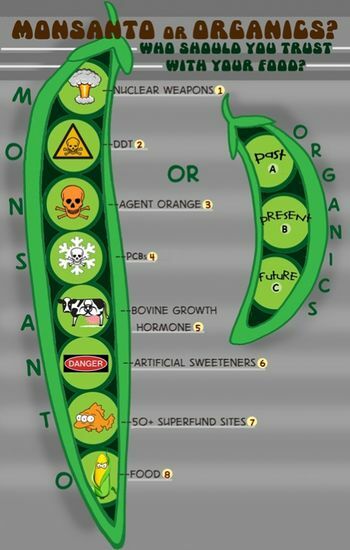 Monsanto is one of the "Big 6" Biotech Corporations, along with BASF, Bayer, Dow Chemical Company, Dupont, and Syngenta (so called because they dominate the agricultural input market -- that is, they own the world’s seed, pesticide and biotechnology industries). SAFETY: Monsanto's Roundup herbiside is the most used in the United States. The key chemical in Roundup is glyphosate. Glyphosate was labeled a probable human carcinogen, hazardous to works and consumers, by the World Health Organization in 2015. "The new classification by the International Agency for Research on Cancer, a branch of the World Health Organization, is based on research on human exposure in the U.S., Canada and Sweden and on animal studies that found what the agency called “convincing evidence” that the chemical caused cancer in laboratory animals." Monsanto is perhaps the most controversial of the Big 6 and is considered the mother of agricultural biotechnology. The company produces biotechnology, genomics and herbicides for corn, cotton, oil seeds, and vegetables. It produces genetically altered seeds to tolerate it's flagship product, Roundup. Monsanto also produces Asgrow, DEKALB, Deltapine, and Seminis seeds. Other products have included Agent Orange, the now ubiquitous PCBs, DDT, Recombinant Bovine Growth Hormone (rBGH) and Aspartame. Access Monsanto's corporate rap sheet compiled and written by Good Jobs First here. A list of ALEC Corporations can be found here. The Monsanto company was created in 1901 by John Francis Queeny (photo) and named after his wife, Olga Mendez Monsanto. Monsanto was originally founded to produce saccharine, an artificial sweetener that at the time was only available in Germany. The company soon expanded into other products including "caffeine, vanillin, aspirin, synthetic rubber and synthetic fibers." Monsanto was heavily involved in the creation of the first nuclear bomb for the Manhattan Project during WWII via its facilities in Dayton, Ohio. The Dayton Project was headed by Charlie Thomas, Director of Monsanto's Central Research Department. He later became the company's president. Monsanto also operated a nuclear facility for the federal government in Miamisburg, Ohio, called the Mound Project, until the 1980s. IG Farben was not dissolved until 2003. See also pharmaceutical industry. "After attracting a total of 20 million visitors from 1957 to 1967, Disney finally tore the house down, but discovered it would not go down without a fight. According to Monsanto Magazine, wrecking balls literally bounced off the glass-fiber, reinforced polyester material. Torches, jackhammers, chain saws and shovels did not work. Finally, choker cables were used to squeeze off parts of the house bit by bit to be trucked away." However, another of its synthetic inventions, Astroturf (fake grass), survives. See also the history of Monsanto timeline. Monsanto expanded into producing herbicides after World War II, including the brands Ramrod, Lasso, and (later on) Roundup. In 1985, it acquired the drug company G. D. Searle, which produced aspartame under the brand name NutraSweet. At the time, Searle faced lawsuits related to its Copper-7 intrauterine contraceptive device. Beginning in the 1980s, Monsanto focused more intensively on agricultural biotechnology. According to research by Good Jobs First, the company initially aimed to develop "crops that would not be damaged when the company's herbicide Roundup was applied to kill weeds," a strategy it continues to pursue today. 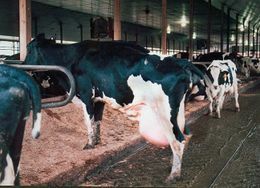 The first genetically engineered product made by Monsanto was bovine somatotropin (BST, sold under the name Posilac), a growth hormone given to dairy cows to artificially stimulate milk production. BST was approved by the FDA in 1993 despite protests by consumers and grocery stores. Monsanto continued its move into biotech with several acquisitions in this period, including Calgene, which produced a controversial genetically modified tomato called the Flavr Savr; and DeKalb Genetics and Cargill, both seed producers. "It announced plans to spin off the remainder of its old chemical business into a company called Solutia (which later filed for bankruptcy as a result of legal settlements relating to PCBs); the sweetener business was also sold off. The agriculture and pharmaceuticals businesses merged with Pharmacia & Upjohn in 2000, with the combined company taking the name Pharmacia. "Pharmacia then spun off the agricultural business as the new Monsanto (the rest of the company was acquired by Pfizer). During the following years Monsanto focused on the seed business, purchasing regional firms as well as the large fruit and vegetable seed company Seminis; it later bought the large cotton seed company Delta and Pine Land as well." According to a 2013 report by Food and Water Watch (FWW), "Monsanto’s day-to-day operations have wreaked havoc on the environment and public health." FWW specifically cites Monsanto's past production of polychlorinated biphenyls (PCBs). Monsanto produced about 99 percent of PCBs used by U.S. industry at its plant in Sauget, Illinois until PCB production was banned by Congress in 1976, due to their carcinogenic properties and detrimental effects to the liver, endocrine system, immune system, reproductive system, developmental system, skin, eye and brain. Despite the ban, PCBs continue to be illegally dumped or leaked, and since these chemicals do not break down easily, they continue to cycle through air, water and soil for long periods of time. Thus PCBs continue accumulating in plants and food crops, as well as in fish and other aquatic organisms, which are then ingested by other animals building up higher levels of PCBs as they move up the food chain. For more see Monsanto's Global Pollution Legacy. "In 1986 a federal jury in Galveston, Texas found Monsanto guilty of negligence and ordered the company to pay $108 million to the family of a worker who died from leukemia after being exposed to benzene while working at a Monsanto chemical plant. Monsanto had refused to pay workers compensation to the family, insisting that the disease was not work-related. The award was later overturned and the family settled with Monsanto for $6 million." "In 1987 a state court jury found Monsanto liable for failing to warn the residents of Sturgeon, Missouri about the risks of a 1979 train accident that spilled chemicals including a small quantity of dioxin. The residents were granted more than $16 million in damages, but the award was later overturned." "In 1988 Monsanto agreed to pay $1.5 million to settle a lawsuit that had been brought by a group of workers who charged that their exposure to a rubber additive at the company's plant in Nitro, West Virginia caused them to contract a rare form of bladder cancer." "In 2003 Monsanto (which retained liability for some liability matters relating to its old chemical businesses), along with Solutia and Pfizer (which had acquired Pharmacia), agreed to pay some $700 million to settle a lawsuit over the dumping of PCBs in Anniston, Alabama." "In 2007 The Guardian reported that it had obtained evidence that dozens of dangerous chemicals related to dioxins, Agent Orange and PCBs were leaking from an unlined quarry in Britain that was among various landfills in the country believed to have been used as dump sites for contractors working for Monsanto decades earlier." Solutla (former Monsanto) Plant in Nitro, West Virginia: Monsanto and Pharmacia entered into a Consent Order with the EPA in 2004 to perform evaluation and cleanup for release of dioxin from the 2,4,5-T (a component of Agent Orange) manufacturing plant over a 20-year period. In April 2014, the Vermont legislature passed the first state-level law requiring genetically engineered foods to be labeled, despite Monsanto's threats to sue the state. Upon signing the law, Vermont Gov. Peter Shumlin said, "we believe we have a right to know what’s in the food we buy." According to the Washington Post, Vermont "officials were so sure of a challenge that the measure itself creates a $1.5 million legal defense fund, to be paid for with settlements won by the state." A suit was brought later in 2014 by the National Association of Manufacturers, the Grocery Manufacturers Association (of which Monsanto has been listed as a member), and other groups. They said they sued the state because the law "places undue burdens on industry and violates the U.S. Constitution," as reported by the St. Louis Post-Dispatch. Among other things, the suit argues "that genetically modified food labels constitute political, rather than commercial, speech and therefore a decision not to use them carries greater First Amendment protection." In November 2014, the state of Vermont announced that it was asking for the suit to be thrown out, arguing that "the mere fact that there is public debate about the wisdom of genetic engineering does not confer protected status to what is otherwise garden-variety commercial speech." Hawai'i has become "ground zero" in the controversy over GMO crops and pesticides, according to some reports. Hawai'i County banned cultivation of GMOs altogether in November 2013. And voters in Maui County passed a ballot referendum establishing a moratorium on growing GMOs in November 2014, despite opponents spending around $8 million against the initiative. Monsanto and Dow Agrosciences sued Maui County over the new law in federal court, just as they threatened to do the day after the election. The suit "asks a judge to immediately prevent the law from taking effect. It also seeks to invalidate the new law, which voters narrowly adopted during last week's election after an intense campaign featuring $8 million in spending by the seed companies against the initiative," as reported by the Associated Press. For more, see Labeling Issues, Revolving Doors, rBGH, Bribery and Monsanto. In May 2012, a broad coalition of food, farm, health, public interest, and environmental groups all over the country, joined by leading organic food companies, raised one million dollars to support the California Right to Know Genetically Engineered Food Act, a citizens' ballot initiative, and other state GMO-labeling campaigns. The money was raised in response to efforts by Monsanto and "California Citizens Against Lawsuit Abuse" (CALA) to dissuade and confuse more than 90 percent of California voters who want labels on genetically engineered food. Monsanto's "Roundup Ready" crops have been genetically engineered to allow direct application of the Monsanto herbicide glyphosate, which lets farmers drench both their cropland with the herbicide to kill nearby weeds without killing the crops. According to Charles M. Benbrook, an expert in the field: "RR soybeans are heavily herbicide dependent." For more, see Monsanto's Roundup Ready Controversy. Monsanto came under heavy public fire with the development of their "Terminator Technology", a.k.a. "suicide seeds", known technically as V-GURTs (varietal Genetic Use Restriction Technologies), in which the seeds resulting from the first year's planting would be sterile, thereby forcing farmers around the world in the Roundup Ready System to buy their seed from them every year rather than saving their best seed for the next years planting, a traditional and economical practice. Seed saving has had the benefit of allowing farmers to continually improve the quality of their crops through careful artificial selection. Fears were also expressed that Monsanto's terminator genes could spread to wild plants. According to the UN Commission on Genetic Resources for Food and Agriculture, "Cross-fertilising V-GURT containing crops may cause considerable effects in neighbouring crop stands and wild relatives.... The fact that in North America, where large stands of GMO varieties are now grown contamination of non-GMO varieties by GMO germplasm has been observed ... suggests that this scenario is a realistic probability." For more, see Monsanto and Terminator Technology. Monsanto partially funds the anti-organic Center for Global Food Issues, a project of the right-wing Hudson Institute. It is run by Dennis Avery and his son Alex Avery. See also Hudson's anti-environmental and pro-biotech spinmeister Michael Fumento, who secretly took at least $60,000 from Monsanto. See also Bill Berkowitz, Hudson Institute: Home of the indicted and the exposed, Media Transparency, January 18, 2006. In 1998, Dennis wrote an article that began, "According to recent data compiled by the U.S. Centers for Disease Control (CDC), people who eat organic and natural foods are eight times as likely as the rest of the population to be attacked by a deadly new strain of E. coli bacteria (0157:H7)." However, Robert Tauxe, M.D., chief of the food borne and diarrheal diseases branch of the CDC, told GMWatch that there is no such data on organic food production in existence at their centers, and that Avery's claims are "absolutely not true." Following in his father's steps, Alex distorted a study from the Journal of Food Protection that showed that organic food does not contain more pathogens than conventionally grown, contrary to Avery's claims. For more, see Monsanto and the Campaign to Undermine Organics. Read the article, "The Silencing of Hector Valenzuela," by Paul Koberstein and Eliza Murphy, Cascadia Times/PR Watch, May 20, 2015. In June 2010, one month after Hashimoto denied Valenzuela’s academic freedom complaint, CTAHR received a $100,000 donation from Monsanto for scholarships. Then in November 2010, Monsanto donated $20,000 to fund Gene-ius Day, a program at the college that introduces students from grades 4 through 12 to “basic genetics and the function of DNA.” And in September 2011, Monsanto gave an additional $500,000 to the college, bringing its total donations to CTAHR to $620,000 within a period of a little more than a year. Organic farms are increasingly finding that via cross-pollination their pure food has been contaminated with GM DNA, thus ruining their businesses. "In 2002, Ontario farmer Alex Nurnberg had tests conducted on his 100-ton harvest of organic corn. Twenty tons were found to be contaminated by GMOs, which Nurnberg believes were blown by the wind from the corn on a neighboring farm. 'I was not ready for it. I feel such a wrath about it,' says Nurnberg." For more see Monsanto, Genetic Pollution and Monopolism. "SUMMARY: Based on the scientific uncertainty surrounding both the molecular characterization of genetically engineered (GE) crops as well as the detection of potential allergenicity, there is more than enough uncertainty to decide to require labeling of foods produced via GE as a risk management measure as a way to identify unintended health effects that may occur post approval. If foods are not labeled as to GE status, it would be very difficult to even identify an unexpected health effect resulting from a GE food." For more, see Reasons for Labeling of Genetically Engineered Foods. An issue of growing concern is the Campaign to Label Genetically Engineered Foods . Many have questioned why it is that while consumers in all of Europe and about fifty other countries around the world including Japan, India and China are guaranteed the right to know through strict labeling standards what foods contain GM ingredients, while consumers in the United States are denied this same right. Polls indicate that the great majority of Americans who are aware of the issue want labels. "Monsanto's board members have worked for the EPA, advised the U.S. Department of Agriculture (USDA) and served on President Obama's Advisory Committee for Trade Policy and Negotiations. They presided over multiple universities in various senior positions, including South Dakota State university (with whom Monsanto has a significant research agreement), Arizona State's Biodesign Institue and Washington University in St. Louis. Monsanto shares board members with other corporations such as Procter & Gamble, Lockheed Martin and Synthetic Genomics. The company's board members have been a part of the International food and Agricultural Trade Policy Council, the Council for Biotechnology Information, the United Kingdom Academy of Medicine, the National Academy of Sciences Biological Weapons working group, CropLife International and the Council on Foreign Relations. The prevalence of Monsanto's directors in these highly influential positions begs a closer look at how they're able to push the pro-GE agenda within the government and influence public opinion." Additionally, Monsanto ties to the Food and Drug Administration (FDA) have also come into question, especially with regards to the FDA's approval of recombinant bovine growth hormone (rBGH), which has been the subject of much criticism and investigation. In 1994, at the request of Representatives George Brown of California, David Obey of Wisconsin, and Bernie Sanders of Vermont, the Government Accountability Office investigated three FDA employees for conflicts of interest. Michael Taylor, Margaret Miller, and Suzanne Sechen had all been involved in Monsanto's initial rBGH studies and then went on to work for the FDA in positions that were later responsible for review of those same studies. Food crops are not the only area Monsanto and others have hoped to cash in on with their technology, also with frightening consequences, a range of genetically engineered "designer" trees and forests are also high on their list. From trees modified to withstand Monsanto's Roundup to trees designed with a reduced lignin content (lignin gives trees strength and rigidity) to appeal to the paper making and construction industry to "terminator trees" which don't produce seeds. This has met with fierce resistance from activists and scientists alike, but again, to no avail. Already there has been a contamination issue with the GE papaya tree, the world's first commercially planted genetically engineered tree, which enraged local farmers in Hawaii. For more, see Monsanto and GM Trees And Grasses. Monsanto made news in 2004 when it decided to withdraw its GM wheat from the market due to worldwide opposition. Environmental risks of GM wheat. Update: Monsanto has apparently changed its mind and again is attempting to commence cultivation of GM wheat. "'We’re encouraged,' says Monsanto’s Trish Jordan. 'There may be some opportunity for us to re-enter the wheat space'" . This has created a furor with wheat growers, see Definitive Global Rejection of Genetically Engineered Wheat. For more, see Monsanto and food safety issues. In 2005, Monsanto was charged with bribing an Indonesian government official by the U.S. Department of Justice. According to the DoJ, a Monsanto employee authorized an Indonesian consulting firm to pay $50,000 to a senior environmental official in order to "incentivize" him to amend the requirement for conducting an environmental impact study before getting approval to grow genetically modified crops. Monsanto agreed to comply with the DoJ investigation and to pay a $1 million penalty. In January 2001, more than 1,000 poor farmers in Brazil "stormed" a Monsanto biotech plant in Nao Me Toque, Brazil. The timing of the protest coincided with a counter-globalization summit, the World Social Forum, which was meeting in Porto Alegre in opposition to the World Economic Forum in Davos. According to a report by the Organic Consumers Association, "the poor farmers yanked out GM corn and soybean crops at the experimental farm on Friday morning. Hundreds of families and their barefoot children took over the research center and warehouses, hanging hammocks and setting up mattresses and boxes of food. They scrawled on the walls, 'The seed of death!' and 'Monsanto is the end of farmers!'" A local leader of the farmers, Solet Compolete, said, "We want to make a statement ... [T]hese seeds trick farmers and create dependency on seeds produced by a big multinational." Farmers in India are finding that the "biotechnology revolution" is having a devastating effect on their crop lands and personal debt levels, according to Vandana Shiva, leader of the movement to oust Monsanto from India. "In 1998, the World Bank's structural adjustment policies forced India to open up its seed sector to global corporations like Cargill, Monsanto, and Syngenta. The global corporations changed the input economy overnight. Farm saved seeds were replaced by corporate seeds which needed fertilizers and pesticides and could not be saved," Shiva has written. For more, see Monsanto in India. Dr Ignacio Chapela, Associate Professor at UC Berkeley, and graduate student David Quist were the target of attack by Monsanto after publishing a paper in the science journal Nature telling of the contamination of indigenous Mexican maize (corn) with GMOs. Monsanto employed the services of a firm called Bivings Group, which used a phony e-mail campaign to persuade the prestigious science journal Nature to retract the paper, the first time in the publication's 133 year history that it had ever retracted a paper. For more, see Monsanto's Mexican Maize Mischief. Monsanto was one of the principal companies to supply Agent Orange to the U.S. government during the Vietnam War. Agent Orange is a defoliant that was used in Vietnam between 1962 and 1971 to "clear vegetation around military bases and obliterate hiding places and rice paddies used by the Viet Cong." It is made from two herbicide compounds, 2,4-D and 2,4,5-T, and releases dioxin as a byproduct of the manufacturing process that becomes contained within 2,4,5-T (and in some instances in 2,4-D). Dioxin is highly carcinogenic and one of the most dangerous chemicals known to man. "Agent Orange was manufactured by Monsanto, Dow Chemicals (manufacturers of napalm), Uniroyal, Hercules, Diamond Shamrock, Thompson Chemical and TH Agriculture. Monsanto [was] the main supplier. The Agent Orange produced by Monsanto had dioxin levels many times higher than that produced by Dow Chemicals, the other major supplier of Agent Orange to Vietnam.... Monsanto's involvement with the production of dioxin contaminated 2,4,5-T dates back to the late 1940s. 'Almost immediately workers started getting sick with skin rashes, inexplicable pains in the limbs, joints and other parts of the body, weakness, irritability, nervousness and loss of libido,' to quote Peter Sills, author of a forthcoming book on dioxins. Internal Monsanto memos show that Monsanto knew of the problems but once again a cover-up was the order of the day.... Operation Hades, later changed to Operation Ranch Hand, sprayed 6 million acres of forest in Vietnam, 19 million gallons of defoliant. The intention was to turn Vietnam into desert, to cause such destruction that Vietnam would never recover.... The most gruesome legacy caused by spraying Vietnam with dioxin contaminated Agent Orange was that born by the Vietnamese themselves. In a locked room of Tu Du Obstetrical and Gynaecological Hospital in Saigon are rows of formaldehyde-filled jars containing deformed fetuses, a grotesque illustration of Man's inhumanity to Man. The level of poverty in Vietnam prevents the preservation of further examples. Many of the living have fared little better, limb deformities, cancers." The Vietnam Association for Victims of Agent Orange filed a lawsuit against the manufacturers of the chemical in 2004. The case was dismissed in 2005, and a court upheld the dismissal in 2007. For more, see Monsanto, Agent Orange, Dioxins and Plan Colombia. Monsanto has come under public scrutiny for its role in litigation against individual farmers for patent violation claims on GE seeds. The company has sued many farmers when their GM crops have turned up in the farmer's fields even though the farmers say they never planted them (examples include Percy Schmeiser, the Nelson Farm, Richard Thompson, etc). GE seed contamination is a legitimate concern for which Monsanto has refused to take responsibility. The very nature of plant reproduction means that pollen from crops is carried by the wind or insects to reproduce elsewhere, meaning that any crops grown near GE crops are at risk of GE contamination through cross-pollination. "Monsanto ensures its right to sue farmers through the company’s technology licensing agreement on every bag of GE seed. Any farmer who buys Monsanto’s seed is bound to it, either by signing a contract or simply opening the bag, and it stipulates that farmers must not save any seed (a thousands-year-old tradition) and are responsible for following all procedures included in Monsanto’s Technology Use Guide...The agreement also allows Monsanto to investigate farmers’ fields at any time, and to access farmers’ records filed with the USDA Farm Service Agency. These records tell Monsanto how many bags a farmer bought and exactly how many acres he planted the seed on, making property investigations and prosecution very easy. To make things even simpler, Monsanto set up a toll-free where neighbors and community members are encouraged to anonymously tattle on farmers that may be using Monsanto’s seeds without a license. The company fiercely defends its patent rights and stands behind the claim that it should be able to collect damages from anyone who violates them. To achieve these ends, Monsanto has hired private investigators to videotape farmers, sneak into community meetings and interview informants about local farming activities. The cases that result from the information Monsanto collects have seen the company demanding thousands of dollars in damages and legal fees from farmers who never chose to plant the company’s seeds in the first place." For an expose of Monsanto's legal battles with American farmers see the report: Monsanto vs. U.S. Farmers. For more see Goliath and David: Monsanto's Legal Battles against Farmers. Monsanto, ever on the lookout for a new financial opportunity, especially one which, on the surface at least, appears to be benevolent found one in biofuels. The growing of corn, in Monsanto's case, genetically engineered corn, for the production of ethanol purportedly to reduce the use of fossil fuels . Unfortunately though, as is often the case with Monsanto, this silver lining has a rather large and ominous cloud, and in the massive diversion of land once used to grow food to growing crops for the fueling of automobiles yet another crisis has ensued. In early 2010, Monsanto, along with other biotech companies and philanthropists, became involved in an ongoing project designed to develop new African drought-tolerant maize varieties. While the new seeds promise increased yields during drought years, the project (specifically Monsanto's involvement) is not without controversy. For more see Monsanto and the World Food Crisis. Monsanto does animal testing. The company contract tests out to Huntingdon Life Sciences (HLS). HLS is the 3rd largest contract research organization (CRO) in the world and the largest animal testing facility in all of Europe. Firms hire HLS to conduct animal toxicity tests for agrochemicals, petrochemicals, household products, pharmaceutical drugs and toxins. HLS has a long history of gross animal welfare violations. See also Huntingdon Life Sciences. In an example of blatantly misleading consumers, Monsanto released advertisements in New York for its "Roundup" herbicide, claiming that it "biodegrades into naturally occurring elements," "will not wash or leach in the soil," and "can be used where kids and pets'll play." The company also claimed that the main ingredient in Roundup, glyphosate, "is less toxic to rats than table salt" and is "practically non-toxic." The ads were brought to the then-New York Attorney General, Dennis Vacco, for using misleading information, and all of the claims were found to be false and misleading. Vacco stated that "ads cannot imply that these pesticides, which are used to kill vegetation, are risk free." "Its model of agriculture brings higher costs for farmers in the United States and abroad, while Monsanto and other biotech companies reap the profits. GE crops have shown little benefit over conventional crops, as the herbicide- and pesticide-laden crops have led to weed and pest resistance, have shown small increase or no yield advantage and have not reduced agrochemical use. Further, the 2009 International Assessment of Agriculture Knowledge, Science and Technology for Development concluded that the high costs for seeds and chemicals, uncertain yields and potential to undermine local food security makes biotechnology a poor choice for the developing world." In the fall of 1996, award-winning investigative journalists Steve Wilson and Jane Akre were hired by WTVT in Tampa, Florida to produce a series on rBGH. After over a year's work and three days before the series was scheduled to air, Fox News executives received the first of two letters from Monsanto's lawyers. According to the letters, Monsanto would suffer "enormous damage" if the series ran. The second letter warned of "dire consequences" of the series was aired as it stood. (How Monsanto knew what was in the series, remains a mystery.) WTVT had been advertising the series aggressively, but canceled it at the last moment. According to Florida Court records, Fox's lawyers then attempted to water down the series, twice offering to pay the journalists to leave the station and keep quiet about what had been done to their work. The reporters refused and filed a lawsuit against WTVT on April 2, 1998. The lawsuit charged that WTVT violated its license from the Federal Communications Commission (FCC), by demanding that the journalists include known falsehoods in the rBGH series. They also charged that WTVT violated Florida's whistle blower law. On three separate occasions, Fox attempted to have the case summarily dismissed. However, after a five-week trial and six hours of deliberation ending on August 18, 2000, the jury unanimously determined that Fox "acted intentionally and deliberately to falsify or distort the plaintiffs' news reporting on BGH." They also found that Jane's threat to blow the whistle on Fox to the FCC, was the sole reason for their termination. She was awarded $425,000 in damages. On February 14, 2003, after six rejections by three different judges, Fox finally managed to win an appeal. For more, see Monsanto and Fox: Partners in Censorship. Monsanto has donated to Rick Berman's front group Center for Consumer Freedom (CCF). CCF runs attack campaigns against health, food safety, animal rights and animal welfare advocates. According to the corporate profile developed by Good Jobs First, in the 1990s, "Monsanto and other biotech companies devoted tens of millions of dollars to make their case, forming front groups such as the Alliance for Better Foods." A 2001 investigation by the New York Times noted that Monsanto has long been "a political power with deep connections in Washington," exerting a powerful influence over the regulations and laws that to govern the biotech industry. According to the New York Times, "What Monsanto wished for from Washington, Monsanto -- and, by extension, the biotechnology industry -- got. If the company's strategy demanded regulations, rules favored by the industry were adopted. And when the company abruptly decided that it needed to throw off the regulations and speed its foods to market, the White House quickly ushered through an unusually generous policy of self-policing." "In this area, the U.S. government agencies have done exactly what big agribusiness has asked them to do and told them to do," said Dr. Henry Miller, a senior research fellow at the Hoover Institution who was responsible for biotechnology issues at the Food and Drug Administration from 1979 to 1994." The investigation details how Monsanto originally took a slow approach to introducing new biotech products, often attempting to ease the way by consulting with environmental and consumer groups. But in the 1990s, the company switched to a more aggressive "strategy to erase regulatory barriers and shove past the naysayers." Going directly through political channels rather than attempting to gain public support got the company the regulations it asked for, including an FDA policy requiring no testing or labeling for genetically engineered products. Monsanto continues to spend generously on lobbying and political campaigns, as detailed below. Monsanto spent $4,120,000 on federal lobbying in 2014, including $1.5 million spent on outside firms. American Continental Group $200,000 America Invents Act implementation; proposed Reform to Patent Law; cybertheft of identification. Lincoln Policy Group $240,000 "General agricultual issues specific to the biotech industry"; "General outreach with key lawmakers on agriculture issues specific to the biotech industry"; "Outreach on issues related to Chinas regulatory import approval system"
The Russell Group $320,000 Biotechnology Acceptance; Agriculture, Competition, and Related Issues; Reauthorization of the Farm Bill, (H.R. 2642, "Agricultural Act of 2014"). Agriculture, Competition, and Related Issues; Implementation of the Farm Bill, (P.L. 113-79, "Agricultural Act of 2014"); H.R. 4800 and S. 2389 ("The Agriculture, Rural Development, Food and Drug Administration, and Related Agencies Appropriations Act, FY 2015". Monsanto spent $6,940,000 on federal lobbying in 2013, including $1.36 million spent on outside firms. Akin, Gump, Strauss, Hauer & Feld $200,000 Issues relating to international trade agreements; "issues relating to legislation regarding frivolous patent litigation"; S. 1013; H.R. 2024; H.R. 3309; S. 1720; S. 1612. Crawford, Quilty & Mauro $280,000 Agriculture consolidation and competition; Roundup Ready Sugarbeets and Roundup Ready Alfalfa; biotech innovation and regulations. Lincoln Policy Group $60,000 Soy product process. Noble Strategies $120,000 Biotech regulations, Roundup Ready Alfalfa, Roundup Ready Sugarbeets, agriculture research; S. 3240, H.R. 6083, the Agriculture Reform, Food and Jobs Act of 2012; Federal Agriculture Reform and Risk Management Act; implementation of the "America Invents Act"; HR 5973 and S. 2375 Agriculture, Rural Development, Food and Drug Administration, and Related Agencies Appropriations Act, 2013; S. 954: Agriculture Reform, Food, and Jobs Act of 2013; H.R. 1947: Federal Agriculture Reform and Risk Management Act of 2013; S. 1244: Agriculture, Rural Development, Food and Drug Administration, and Related Agencies Appropriations Act, 2014; H.R. 2410: Agriculture, Rural Development, Food and Drug Administration, and Related Agencies Appropriations Act, 2014; H. J. RES. 59: Continuing Appropriations Resolution, 2014. The Russell Group $320,000 Biotechnology acceptance; agriculture, competition, and related issues; FY 2013 Agriculture, Rural Development, Food and Drug Administration, and Related Agencies Appropriations Act, biotechnology approval in Title XII; reauthorization of the Farm Bill, S. 954 ("The Agriculture Reform, Food and Jobs Act of 2013") and H.R.1947 ("The Federal Agriculture Reform and Risk Management Act of 2013"); H.R. 2410 and S. 1244 ("The Agriculture, Rural Development, Food and Drug Administration, and Related Agencies Appropriations Act, FY 2014"). The Washington Tax Group $180,000 Issues related to extension and expansion of alternative simplified research and development tax credit; issues relating to international corporate tax reform; issues related to percentage mine depletion; issues related to the manufacturing deduction; issues related to Chinese regulatory process; foreign agriculture laws, regulations, and trade; Trans-Pacific Partnership (TPP); Trans-Atlantic Trade & Investment Partnership (TTIP); biotech innovation and regulations. American Continental Group $150,000 America Invents Act implementation. Crawford & Mauro Law Firm $75,000 Agriculture consolidation and competition. The Russell Group $160,000 Biotech Acceptance; Agriculture, Competition, and Related Issues; Advocacy for Plant Protection Act concerns; FY 2013 Agriculture Appropriations Act; Work relating to seed trade issues with South America. The Washington Tax Group $90,000 Issues related to extension and expansion of alternative simplified research and development tax credit (H.R. 942, S. 1577); issues relating to international corporate tax reform (S. 727, S. 2091). Nineteen out of Monsanto's 26 lobbyists (73 percent) are "revolving door" or have worked for government at some point in their career, including Stanley Abramson, who worked for the EPA, and Jeremy Stump and Randall Russell, who worked for the U.S. Department of Agriculture. As of the first quarter of 2014, Monsanto had given $428,744 to federal candidates and party committees for the 2014 election cycle. In 2012, Monsanto spent $4.2 million financing "No On 37", a group supported by other GMO food manufacturers like DuPont, Dow, and Bayer. "No On 37" opposed California proposition 37, which would require labels on most genetically modified food products. The company made $1.2 million in federal political contributions during the 2012 campaign cycle. Top recipients included the Republican and Democratic Governor's Associations, Senator Claire McCaskill (D-MO), President Barack Obama, Senator Roy Blunt (R-MO), and Representative Ann Wagner (R-MO). Monsanto gave $658,207 to federal candidates in the 2010 election cycle through its political action committee (PAC) -- 48 percent to Democrats and 52 percent to Republicans. "Monsanto should not have to vouchsafe the safety of biotech food. Our interest is in selling as much of it as possible. Assuring its safety is the F.D.A. 's job" - Philip Angell, Monsanto's director of corporate communications. "Playing God in the Garden" New York Times Magazine, October 25, 1998. Due to its political influence in the U.S. and the claims surrounding Roundup and GMOs, thousands of citizens have signed on to petitions against Monsanto. GMO seeds have been genetically modified to produce their own pesticide, survive the spraying of Roundup and self terminate. They are also incredibly expensive compared to traditional seeds. As a result, farmers in India were forced into total dependence on Monsanto by having to purchase new seeds annually. Because of Monsanto's ruthless drive to use India as a testing ground, 125,000 farmers took their own lives after being driven into a hopeless cycle of debt and losing their lands and homes. GMOs, which were never adequately tested for safety, have failed catastrophically. At least 70% of our food contains genetically engineered food brought by Monsanto. GMO is endangering our health and environment at an alarming rate. Cross contamination is irreversible and good organic crops are being jeopardized. Marcos M. Lutz, CEO of Cosan Ltd.
William U. Parfet, chairman of the board, chief executive officer and President of MPI Research, Inc.
Philip Mattera, Corporate Research Project, Monsanto: Corporate Rap Sheet, last modified August 18, 2013. See also Monsanto:External links & Links to Articles Cited in Monsanto Pages. Claire Robinson and Jonathan Latham, PhD, Bioscience Resource Project, The Goodman Affair: Monsanto Targets the Heart of Science, Independent Science News, May 20, 2013. "Monsanto plans $4.3M R&D lab in PR" (Puerto Rico), Caribbean Business, June 29, 2011. Marie-Monique RobinThe World According to Monsanto, Mongrel Media, September, 2008 ASIN: B001BBQCMC. ↑ Environmental Working Group, Press Release, [World Health Organization Labels Glyphosate Probable Carcinogen http://www.ewg.org/release/world-health-organization-labels-glyphosate-probable-carcinogen], March 20, 2015. ↑ 6.0 6.1 6.2 6.3 6.4 6.5 6.6 6.7 6.8 6.9 Philip Mattera, "Monsanto," corporate rap sheet, Good Jobs First Corporate Research Project, accessed November 18, 2014. ↑ Chapter 2: High-Flux Years, Oak Ridge National Laboratory Review, accessed January 2011. ↑ A Short Curriculum Vitae of I.G. Farben, Biblioteca Plaeyades, accessed October 2009. ↑ Disneyland's Home of the Future, Mindfully.org, accessed January 2011. ↑ Time line: History of Monsanto Co., Reuters, Nov 11, 2009. ↑ Keith Schneider," GROCERS CHALLENGE USE OF NEW DRUG FOR MILK OUTPUT," New York Times, February 4, 1994. ↑ Robert Reinhold, "JURORS ASSESS MONSANTO $108 MILLION OVER DEATH," New York Times, December 13, 1986. Accessed November 18, 2014. ↑ "Monsanto Settles Suit with Family of Chemical Worker," Lodi News-Sentinel, February 23, 1989. Accessed November 18, 2014. ↑ "Monsanto Liable in '79 Dioxin Spill," New York Times, October 23, 1987. Accessed November 18, 2014. ↑ "Dioxin Verdict Following 3 1/2-Year Trial Is Voided," New York Times, June 13, 1991. Accessed November 18, 2014. ↑ "Monsanto to Pay $1.5 Million in Poisoning Case," New York Times, June 9, 1988. Accessed November 18, 2014. ↑ "$700 Million Settlement in Alabama PCB Lawsuit," New York Times, August 21, 2003. Accessed November 18, 2014. ↑ Associated Press, Vermont passes bill to require warning labels for genetically modified foods, The Guardian, April 24, 2014. ↑ Ronnie Cummins and Will Allen, Monsanto Threatens to Sue Vermont if Legislators Pass a Bill Requiring GMO Food to Be Labeled, Alternet, April 4, 2012. ↑ Niraj Chokshi, "Vermont just passed the nation's first GMO food labeling law. Now it prepares to get sued," Washington Post, April 29, 2014. ↑ Dave Gram, "Vermont fights attempt to block GMO labeling law," St. Louis Post-Dispatch, November 17, 2014. ↑ "Hawaii County Council Passes GMO Ban," Civil Beat, November 19, 2013. Accessed November 19, 2014. ↑ "Maui County residents vote ‘Yes' on GMO initiative," Hawai'i News Now, November 5, 2014. Accessed November 19, 2014. ↑ Rebekah Wilce, "Pesticide and GMO Companies Spend Big in Hawai'i," Center for Media and Democracy, PR Watch, June 11, 2014. Accessed November 19, 2014. ↑ 30.0 30.1 Associated Press, "2 developers sue Hawaii county to halt GMO law," Daily Mail, November 14, 2014. ↑ Anita Hofschneider, "Monsanto and Dow to Challenge Maui County GMO Farming Ban," Civil Beat, November 5, 2014. ↑ CA Label GMOs Campaign Files 971,126 Signatures for Ballot Initiative, Causes.com, accessed July 13 2012. ↑ Charles Benbrook, Evidence of the Magnitude and Consequences of the Roundup Ready Soybean Yield Drag from University-Based Varietal Trials in 1998, Mindfully.org, accessed January 2011. ↑ Charles M. Benbrook, Troubled Times Amid Commercial Success for Roundup Ready Soybeans, Mindfully.org, accessed January 2011. ↑ Charles Benbrook: Chief Scientist, The Organic Center, accessed January 2011. ↑ Adam Liptak, Saving Seeds Subjects Farmers to Suits Over Patent, New York Times, November 2, 2003. ↑ Commission on Genetic Resources for Food and Agriculture, Potential Impacts of Genetic Use Restriction Technologies (GURTs) on Agrobiodiversity and Agricultural Production Systems, Background Study Paper No. 15, 2001, p. 15. ↑ 38.0 38.1 GMWatch, Profiles: Dennis T. Avery, archived by the Wayback Machine August 23, 2006. ↑ GMWatch, Dennis Avery: Big Daddy of E.co-Lie, archived by the Wayback Machine September 11, 2007. ↑ Save Organic Food, Information, organizational website, archived by the WayBack Machine January 26, 2009. ↑ David Brough, GM presence in seeds inevitable, EU group says, Reuters, April 6, 2001. ↑ Save Organic Food, Save Organic Food, organizational website, archived by the WayBack Machine January 26, 2009. ↑ GMO Compass, New Labelling Laws: What Has Changed?, organizational website article, December 15, 2005. ↑ Al Krebs, New Poll--94% of Americans Want Labels on GE Foods, Agribusiness Examiner, October 19, 2003, archived by Organic Consumers Association. ↑ Consumers Union, Food Labeling Poll, organizational report, July 11, 2007. ↑ Sam Burcher, [http://archive2.globaljusticeecology.org/index.php?name=getrees&ID=416 Review of "A Silent Forest: The Growing Threat, Genetically Engineered Trees"], Free Radicals, March 24, 2005, archived by Global Justice Ecology Project. ↑ People's Forest Forum, CALL FOR MORATORIUM ON GM TREES, organizational website, archived by the WayBack Machine December 1, 2006. ↑ Rainforest Action Network, GENETICALLY ENGINEERED TREES AND WEYERHAEUSER, organizational website, archived by the WayBack Machine February 19, 2006. ↑ Sierra Club, Genetically Engineered Trees, organizational website, accessed May 2013. ↑ Global Justice Ecology Project, Stop GE Trees, organizational website, accessed May 2013. ↑ Paul Brown, Monsanto abandons worldwide GM wheat project, Guardian, May 10, 2004. ↑ U.S. Department of Justice, "MONSANTO COMPANY CHARGED WITH BRIBING INDONESIAN GOVERNMENT OFFICIAL: PROSECUTION DEFERRED FOR THREE YEARS," government press release, January 6, 2005. ↑ Organic Consumers Association, "Brazilian Farmers Seize Monsanto Facilities in Anti-GE Protest," organizational website report, January 26, 2001. ↑ George Monbiot, The fake persuaders: Corporations are inventing people to rubbish their opponents on the internet, Guardian, May 14, 2002. ↑ Inside HLS, Inside Customers, SHAC.net organizational website, accessed December 2009. ↑ Jury Overturned Verdict on Legal Technicality, BGH Bulletin, accessed January 2011. ↑ 61.0 61.1 61.2 Kurt Eichenwald, Gina Kolata and Melody Petersen, "Biotechnology Food: From the Lab to a Debacle," New York Times, January 25, 2001. ↑ 62.0 62.1 Center for Responsive Politics, "Client Profile: Summary, 2014," OpenSecrets.org federal political influence database, accessed February 2, 2015. ↑ 63.0 63.1 Center for Responsive Politics, "Client Profile: Summary, 2013," OpenSecrets.org federal political influence database, accessed May 6, 2014. ↑ Center for Responsive Politics, Monsanto Co. Influence & Lobbying: 2012, OpenSecrets.org federal political influence database, accessed 2013. ↑ Center for Responsive Politics, "Profile for the 2012 Election Cycle," OpenSecrets.org federal political influence database, accessed May 6, 2014. ↑ Center for Responsive Politics, "Profile for the 2014 Election Cycle," OpenSecrets.org federal political influence database, accessed May 8, 2014. 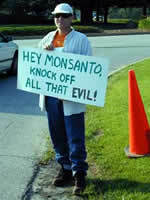 ↑ Stacy Malkan, $4.2 Million from Monsanto, "Yes On 37" campaign website, August 15th, 2012. ↑ Center for Responsive Politics, Monsanto 2010 PAC Summary Data, OpenSecrets.org federal political influence database, accessed January 2011. ↑ Monsanto, SEC Form DEF 14A (Proxy Statement), corporate annual filing, December 10, 2014, p. 70. ↑ Monsanto, Board of Directors, organizational website, accessed June 10, 2016. ↑ Monsanto, Monsanto Shareowners Reelect Board Members at the Company’s Annual Meeting, corporate press release, January 30, 2015. This page was last edited on 11 October 2017, at 20:31.